A very big ‘thank-you’ to Roopesh and Kannada Movies Melbourne for the opportunity to see Gajakesari in the cinema here in Melbourne. 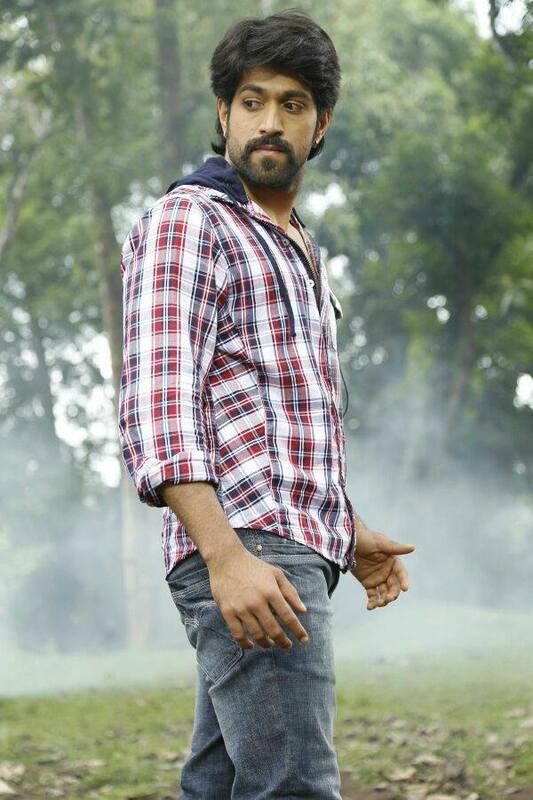 This is the first time I’ve seen Rocking Superstar Yash, and I have to say he is pretty rocking! However the real star of the film is an incredibly well trained elephant called Arjuna, who not only steals every scene when he appears but also perfectly defines the meaning of ‘on-screen chemistry’ with his co-star. Noted cinematographer Krishna has stepped out from behind the camera to write the screenplay and direct this action adventure, which does mean that there are beautifully framed shots throughout even if the screenplay does drag a little at times. On the plus side there is an excellent flashback to a past life which helps lift the film out of the ordinary, and the combination of good fight sequences, an entertaining storyline and a charismatic elephant make Gajakesari better than average. The story opens with the introduction of chief villain Rana (John Vijay) who intimidates the local politician into giving him the right to develop a tribal area somewhere in Karnataka. After establishing that Rana has the nastiest henchmen and also the most googly eyes in SI cinema, the film moves location to a temple in Mysore to introduce Krishna (Yash). Krishna is a modern guy who rides a Royal Enfield and likes to hang around with his two friends, but is about to discover that his freedom is coming to an end. As a child Krishna was promised to the temple and is supposed to take over leadership from the current Mutt (Anant Nag), not something he has any real desire to do. However there seems to be an escape clause – Krishna just has to donate an elephant to the temple and will then be free of his obligations. Now I can see some of the logic behind this since an elephant would no doubt be much less trouble than a rowdy young man. Still it seems to me that a herd of goats would possibly be more useful and easier to house than an elephant. Regardless of convenience, the temple wants an elephant, so Krishna obediently heads up into the hills to find his pachyderm. Luckily for Krishna he easily finds a small tribal village where there are plenty of elephants and the villagers are keen to help him in his quest. However the local elephants don’t appear to want to leave their cosy jungle and since their leader is the particularly angry and intractable Kalinga (Arjuna! ), it seems likely that Krishna may have to enter the temple after all. Krishna though, is a man who seems especially blessed by his temple gods and he manages to calm Kalinga just in time to enlist his aid in fighting off Rana’s thugs. This is the start of a beautiful friendship, based (according to the village shaman) on the circumstance that Krishna is the reincarnation of hero Baahubali and Kalinga the reincarnation of his elephant. This leads into an excellent historical flashback with plenty of heroism and action, although the low budget costuming for the attacking army is a little disappointing. Baahubali and his elephant look awesome though! In the village Krishna also meets Amoolya, who ostensibly is there to record birds but really just seems to be looking for trouble. She has a tendency to wear inappropriately short shorts around the village and while tramping around the jungle, and to add further insult indulges in patronising photography of the villagers. Sadly her character is poorly conceived as she looks nothing like the scientist she is supposed to be and instead is a 2 dimensional throwaway heroine with little apparent rationale for her romance with Krishna. Amoolya does her best but there is very little she can do in such an unconvincing role while looking uncomfortable in most of the outfits. Her best moments are in the songs where she does get the benefit of pretty and dance-friendly shoes, but it’s not enough to justify her presence in the rest of the film. This really is Yash’s film and he is excellent in his role as Krishna. He’s lackadaisical and perfectly casual as Krishna but takes on a completely different and more martial role when we see him as Baahubali. The relationship between Krishna and Kalinga is the lynchpin of the plot in the second half and the two carry it off perfectly – excellent acting by Yash and great screen presence by the elephant combine to make an impressive duo. Forget Amoolya, this is the real relationship that matters in Gajakesari! Yash also looks great in the songs, and not just because he always matches his shoes to his outfits. He has plenty of charm and while his Krishna appears to be a lovable rogue, he also manages to convey an innate honesty and sense of moral integrity. No wonder his elephant loves him and the villagers rely on him to defeat Rana and save their village. Overall Gajakesari works due to Yash’s strong screen presence and a good story. It doesn’t need the added burden of a romance, particularly when it fails to ignite and the heroine seems so completely out of place. The scenes set in the past are definitely a highlight, but the action in the present day is almost as good, and the inclusion of an elephant as a fighting partner is inspired. Definitely one to catch in the theatre if you can and appreciate just how much star quality one elephant can bring to a movie. This entry was posted in Sandalwood and tagged Adventures without subtitles, Amoolya, Amulya, Anant Nag, Arjuna the elephant, Gajakesari, Kannada, Krishna, Sadhu Kokila, Yash. Bookmark the permalink.